Neue Galerie currently has an exhibit of Edvard Munch and his influence on German and Austrian Expressionists, including Beckmann, Heckel, Kirchner, Nolde, Kokoschka, and Shiele, among others. It is a wonderful exhibit and we followed it with a visit to Galerie St. Etienne which is exhibiting Ernst Ludwig Kirchner drawings and watercolors. Pat, Eunice, and I were enthralled with the art seen and each selected a few things we wanted to remember. This painting by Munch is entitled Two Human Beings: The Lonely Ones. 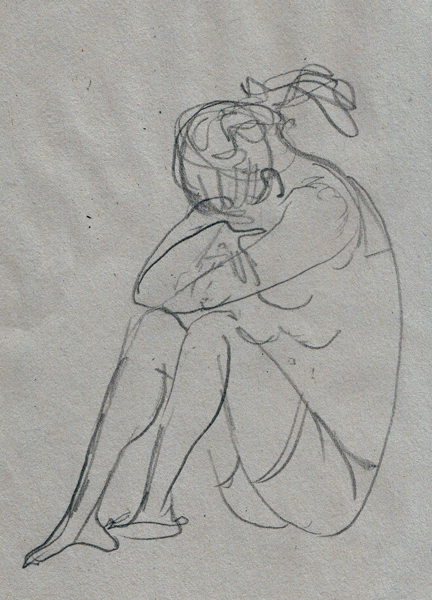 I was struck with the simple separation of figures which demonstrated the emotion of loneliness. 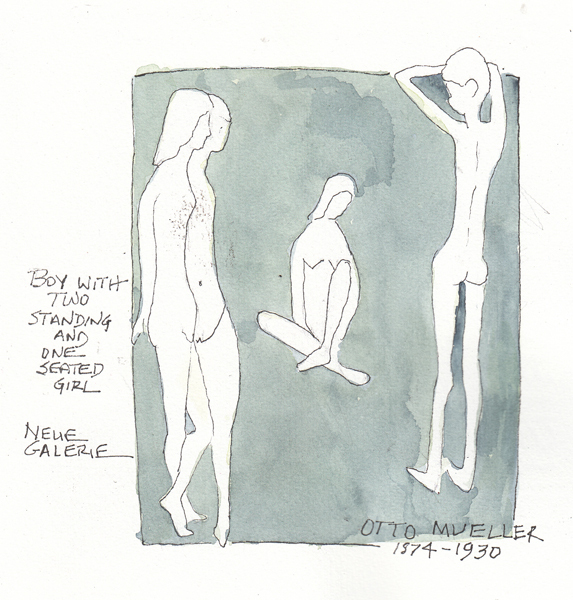 I was inspired to draw a simple version of this painting, and long thin figures from a woodcut by Otto Mueller. 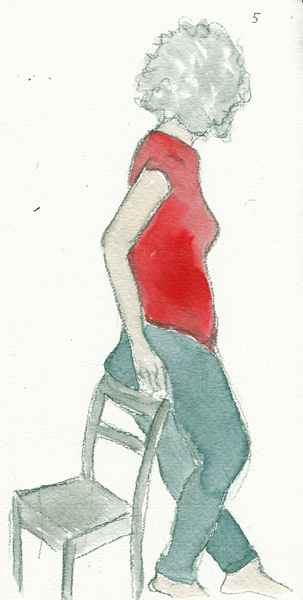 I spend lots of time doing figure drawings, and I'm very interested in how the Expressionists distort figures. 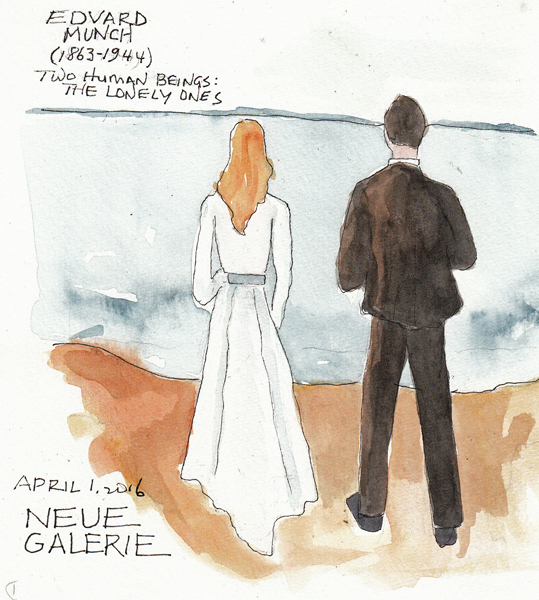 I've drawn Schiele and at this exhibit I wanted to remember Mueller's figures from a complicated woodcut - so I only sketched the figures, not the complicated black ink background in The Boy with Two Standing and One Seated Figure. 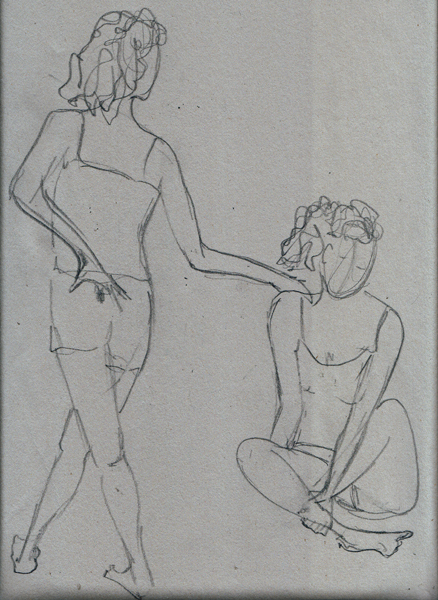 At Galerie St. Etienne, Kirchner's drawings were VERY loose, so I decided to sketch two of his more defined images - one a litho and the other almost a single line drawing. I recommend both of these exhibits for anyone interested in Expressionism. Norwegian Artist Edvard Munch is definitely more than just the painting and woodcuts of The Scream. This was the last of our 9 Art Sessions at Battery Park City until the drop-in program begins in the South Cove from May - Oct. Our model was Claudia, and there were many challenging poses this week. Two Minute Poses: Three chosen from 10 drawn. I'm beginning to feel as if these are easier for me. I draw with a 4B graphite pencil on Newsprint. 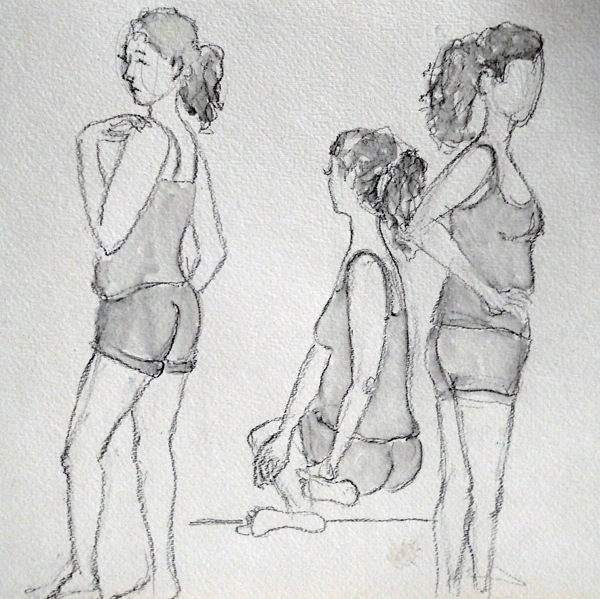 Five Minute Poses: Three of four that I sketched with General Sketch and Wash pencil and shaded with a NiJi waterbrush. 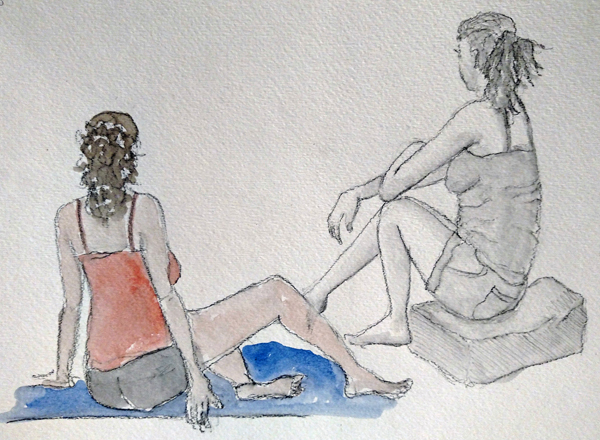 Ten (Left) and Twenty (Right) Minute Poses: The watercolor was added during the 10 minutes pose time, and the soluble graphite was spread with a waterbrush during the 20 minute pose. 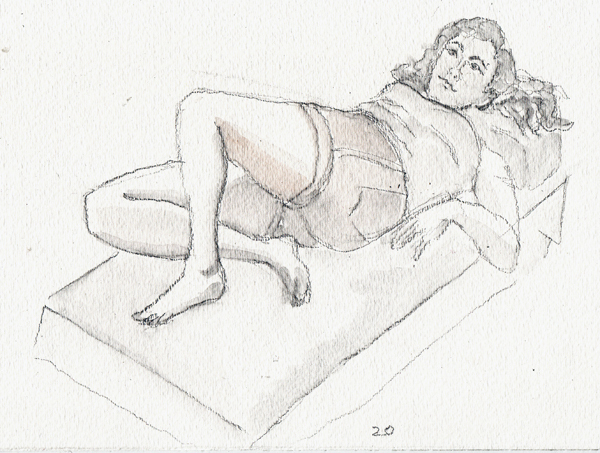 Twenty Minute Pose: I shuddered as our Art Instructor kept rotating the head of the table away from me and my view had increasing foreshortening. It is hard to remember to draw only what you see in this instance, but I did it and now feel more confident about these challenging poses. Today I went to Neue Gallerie with friends and saw so many inspiring figure drawings/paintings by Munch and the other Expressionists. 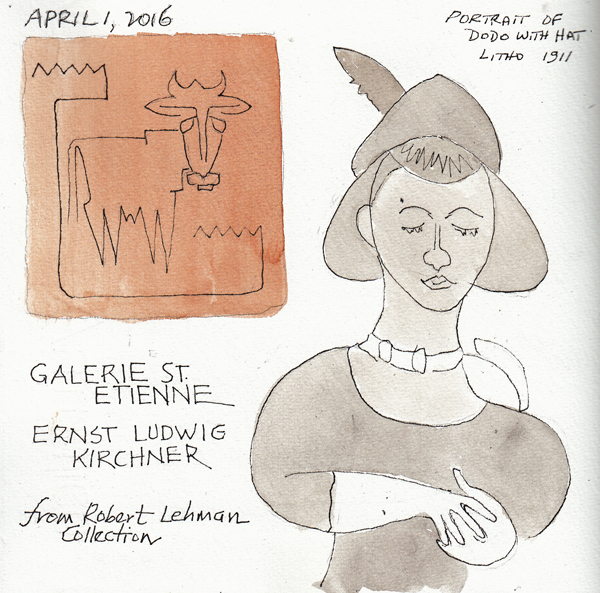 After lunch we went to Galerie St. Etienne and saw "quick" Ludwig Kirchner figure sketches. I recommend both exhibits, but especially Neue. 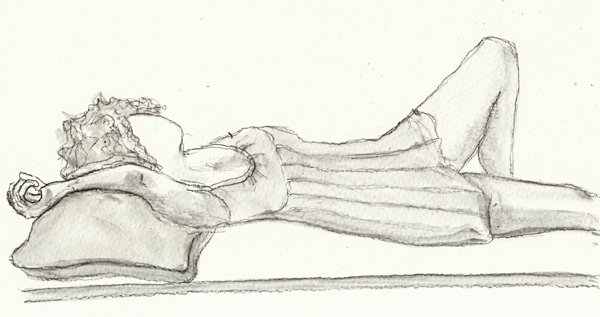 The Battery Park City Winter Art Sessions are divided between Figure and Still Life Drawings. Here are my still life drawings from the last 2 sessions. 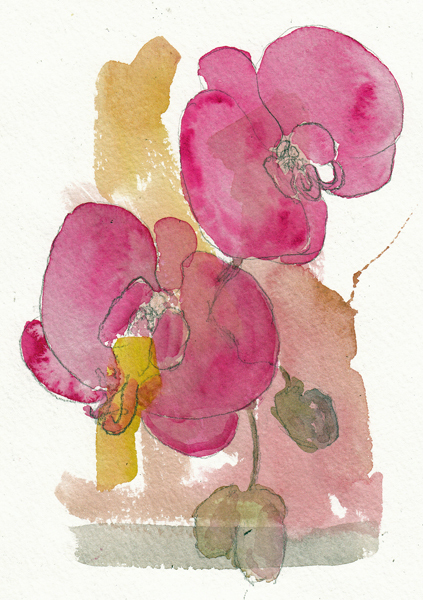 As I was walking to Battery Park, a florist delivery man lost two orchid flowers from the plant he was carrying and I picked them up before they could be squashed by feet on the crowded sidewalk. They were a perfect subject for a quick painting. The Artist in Charge of the session created a still life set up that made me think of San Antonio Spring Fiesta because of the colors and the tambourine and maracas. We lived there for 18 years and the bright Fiesta colors were absorbed and internalized. 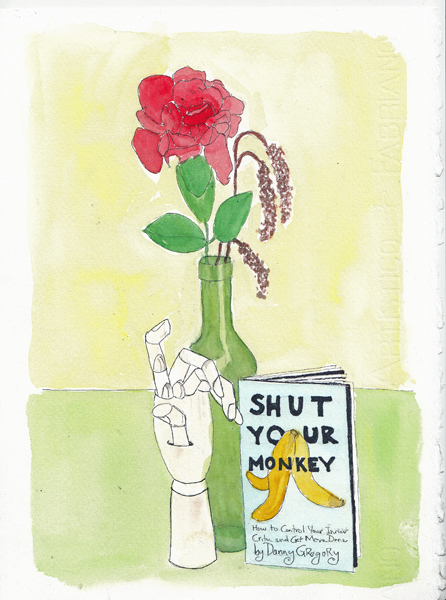 I threw my articulated wood hand model and silk rose in my bag on my way to the next session, and then added Danny Gregory's Shut Your Monkey book which I was reading on the subway and during my lunch at Brookfield Place in Lower Manhattan. Danny's book is all about your inner critic, how to analyze and deal with the one that each creative person has. His is a monkey. Mine is a hypercritical, old lady - who sometimes looks like a bag lady. 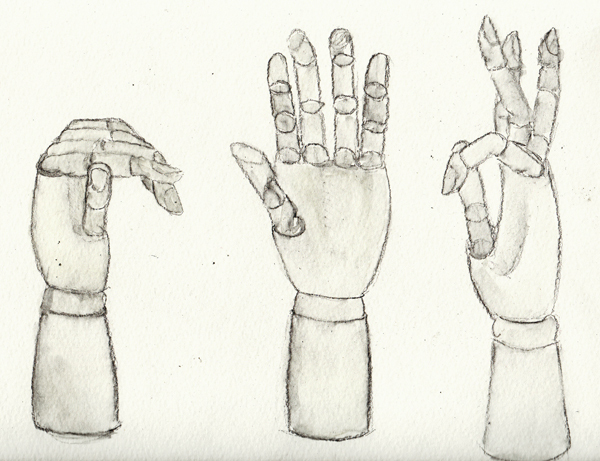 I ended that afternoon by sketching my hand model in 3 different positions with a soluble graphite pencil. 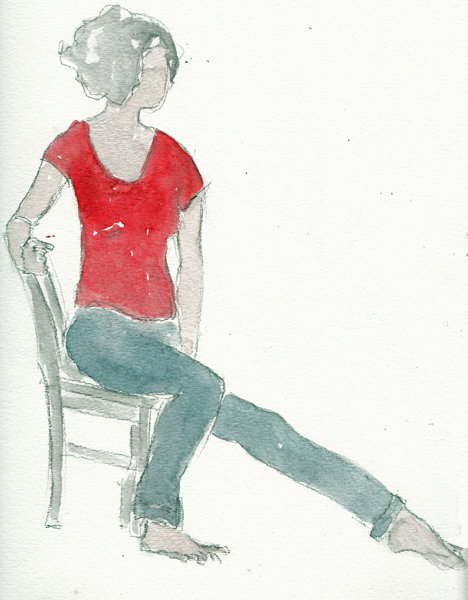 Tomorrow is the last of our 9 sessions and I'm so happy that it is figure drawing! Yesterday my friends and I went to a Museum of Modern Art Members Preview of the new Edgar Degas exhibit. 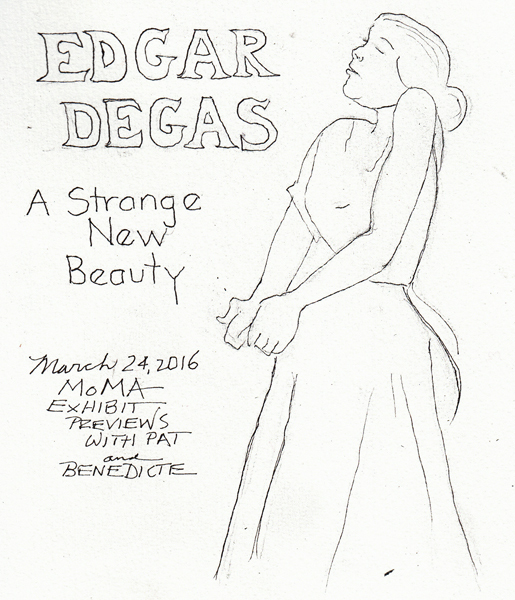 I was surprised to read that it is his first solo exhibit at MoMA! 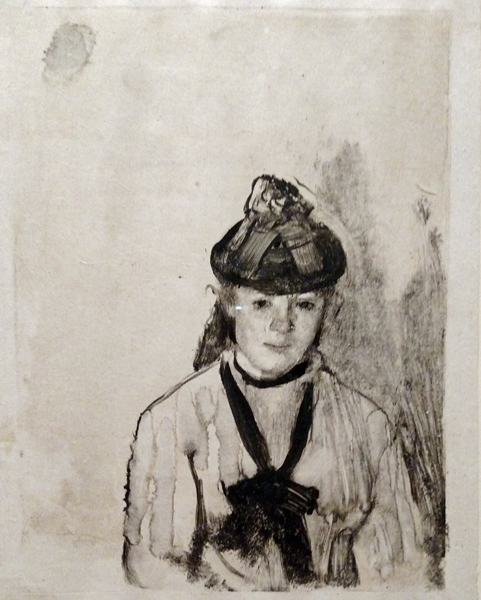 In this exhibit they feature Degas' monotypes, and his working process - along with other drawings and paintings that were definitely influenced by his monotype working style. 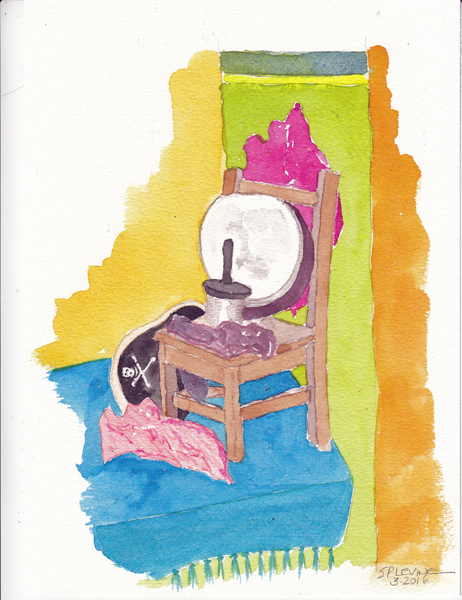 Here is a 4 minute video about Monotypes, as an introduction. Scroll down the museum page for video. 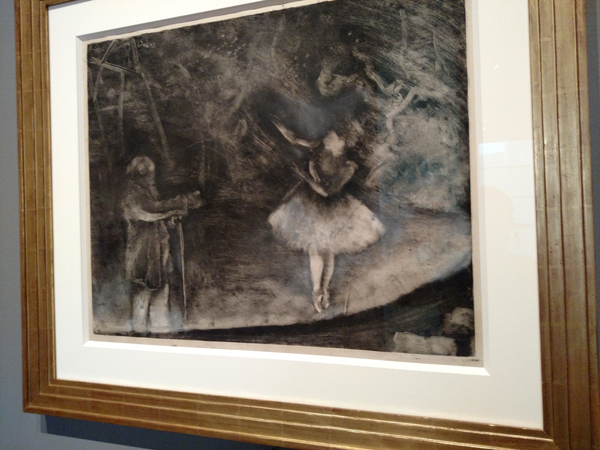 I was fascinated learning about Degas' working methods and that is what I will remember most from this exhibit. His first Monotype -The Ballet Master - done with artist Ludovic Napoleon Lepic, a printmaker. 2. Charcoal drawings were made of the same subject and a quote from him says: It is essential to do the same subject over again, ten times, a hundred times." 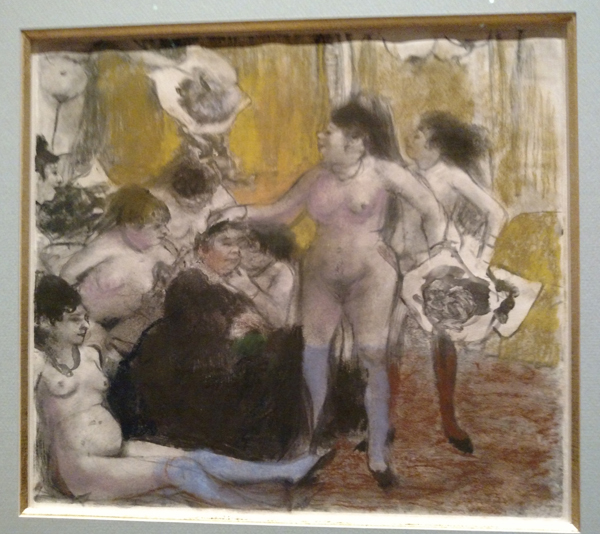 This way to work, multiplying and varying a subject is common to Degas' way of working. 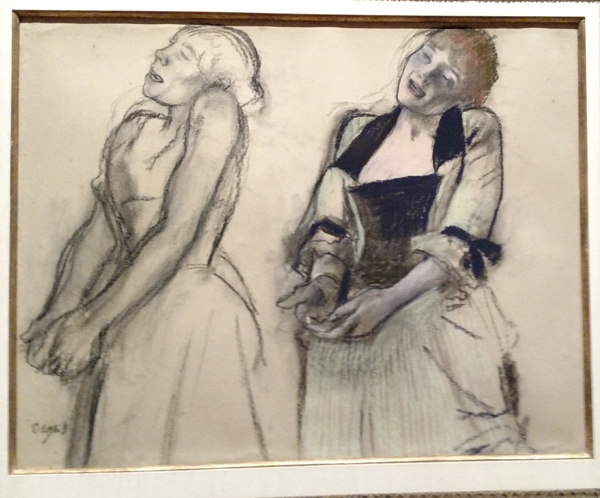 I loved this charcoal drawing and sketched the figure on the left during out visit. 3. This pair of drawings consists of a charcoal drawing on the left (3 drawings of Ludovic Halevy). The one on the right is a counterproof made by placing wet paper over the drawing and then rolling both sheets through the printing press. 4. 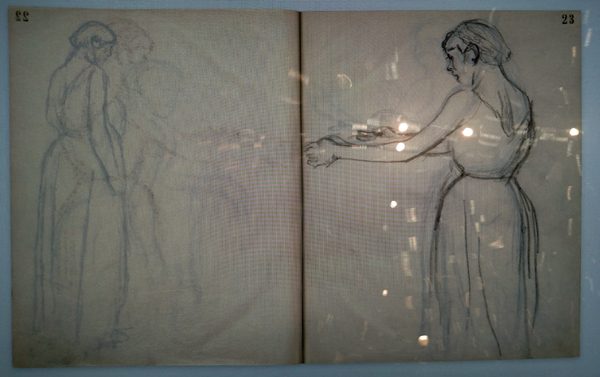 There were 3 full sketchbooks included in the exhibit. 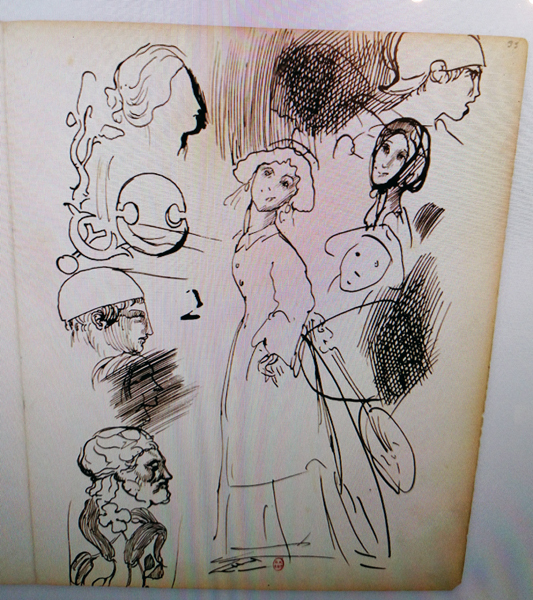 I loved how he included multiple drawings on each page in Carnet 1. 5. Carnet 3 has very thin paper and he used this quality to redraw images on the reverse side of the original drawing, making it possible to change the drawings slightly reversing the images. It was difficult to take a good image from this video display, but the image on the left is the an image seen through thin paper, and the image on the right shows how it was retraced and changed. 6. It is postulated that this painting of 4 ballet dancers was made from images that were manipulated in such a way. For more information about this very interesting and educational exhibit, you can read about it on today's ArtDaily.com It also was reviwed in today's New York Times. I first want to send condolences to the people of Brussels for the horrible terrorist bombings this morning. A good friend of ours was in the airport, close to the bomb blast, but is uninjured. Wednesdays are my day to go past the World Trade Center Memorial as I cross Lower Manhattan to go to figure drawing, and these random bombings reawaken many of the feelings I had living in Manhattan in 2001. 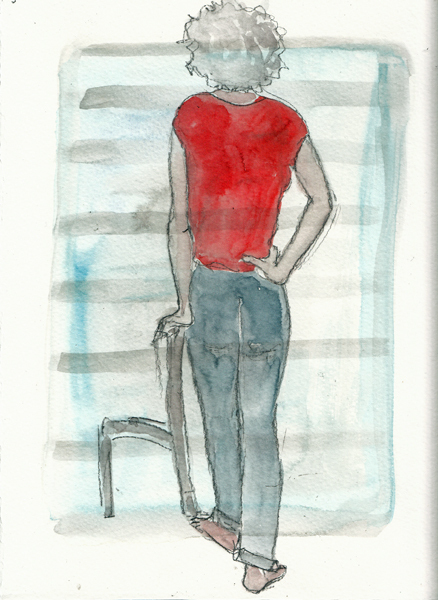 I love going to Lower Manhattan for Figure Drawing on Wednesdays. When I was looking up at the Freedom Tower (WTC1) last Wednesday and posting photos to my blog, I had no idea that we would be reflecting on yet another terrorist attack in Europe this Wednesday. 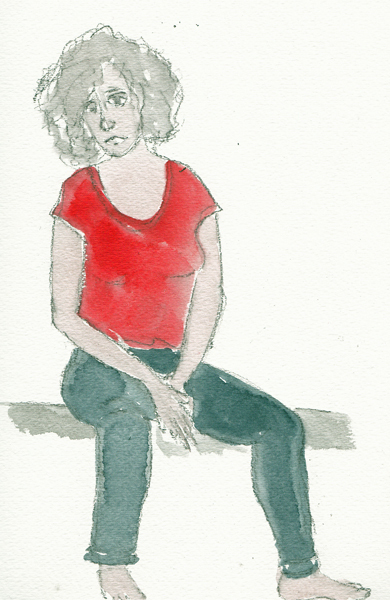 We had a model that I've drawn before, and this week she had her Very Curly Hair au naturelle, and stayed in the same clothes for most of the session. These are my first two minute poses - always used for warmup. I sketched her with a 4B graphite pencil on newsprint - which is hard to flatten out for photographing. 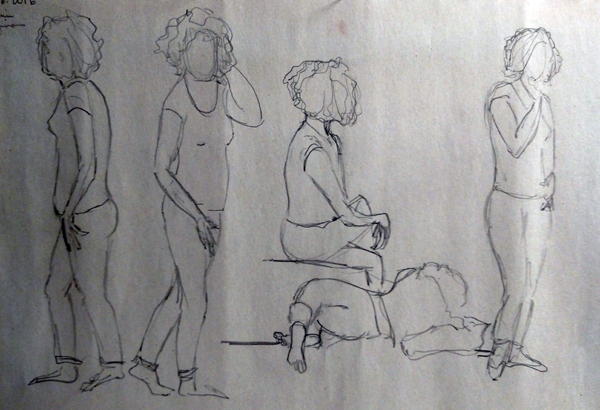 These are three 5 minute sketches done with a General Sketch and Wash pencil - with paint added in the final seconds before the end of the pose, or in one case during her 5 minute break. The final pose - done in 15 minutes - and not painted because I was too tired. On Wednesday May 4th, the Figure Drawing sessions will move to the South Cove of Battery Park City - through October 26th, weather permitting.